OAKLAND, Calif. — As travelers streamed into the Southwest Airlines terminal at Oakland’s International Airport April 5 on one of the year’s busiest travel days, they were greeted by an unusual sight — a crowd of passenger service workers and their supporters outside the terminal, demanding union rights, decent wages and affordable health care. The workers, who check passengers’ identification, help wheelchair travelers and handle luggage, are employed by Aviation Safeguards, a firm providing passenger services for at least 11 airports nationwide, including LAX, San Jose Mineta Airport and JFK. Southwest has contracted for Aviation Safeguards’ services at its Oakland terminal. Workers charge the firm pays low wages, offers a bare-bones health plan only in exchange for a pay cut, gives no sick days and has no regular scheduling for employees. Elaborating further, Orcullo said the workers’ most urgent demand is for “union wages and justice.” Workers must stand for eight hours, he said, and breaks are only 10 minutes. Workers have no break room, he added, and sometimes it takes so long to find the sign-in sheet that they lose the time altogether. Workers and the union they seek to join, SEIU Local 1877, charge that the company’s policies, which have led to heavy turnover, actually compromise airport security. The 125 workers at Oakland Airport have been seeking to organize for over a year, said union organizer Sylvia Ruiz. “At an airport, it’s essential to have workers who are well-trained, like their jobs and want to stay in them,” she added. Aviation Safeguards workers in other locations are waging similar struggles. 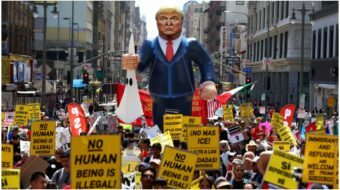 A demonstration was planned for San Jose on April 6. Ruiz said the workers and union are also calling on Southwest, and on the Port of Oakland, which runs the airport, to press Aviation Safeguards to act responsibly. If the Employee Free Choice Act, now before the Senate, were law, it would make a huge difference for the passenger service workers, Ruiz said. 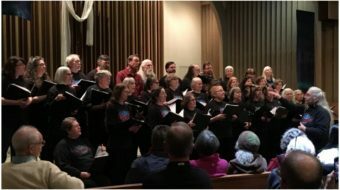 The demonstration, held during the Christian Holy Week, also featured an interfaith service honoring the workers, conducted by clergy from the East Bay Interfaith Committee for Worker Justice. Pastor Ricky Jenkins, an organizer with the Interfaith Committee, said the airport workers are experiencing “typical consequences of corporate greed in the U.S. today.” Currently some of the country’s most important workers are not getting any part of the riches they help corporate America to take in, he added. Decent work, and the ability to form a union, are both a God-given and an American right, Jenkins said. Aviation Safeguards’ permit to operate at the Port of Oakland expires in June. The workers are urging the port to use its status as landlord to ensure better jobs and labor peace as a condition of renewing the contract. The union is also urging calls to Aviation Safeguards CEO Bruce Galloway at (845) 454-3707.